Alexandre Benalla and Emmanuel Macron in Touquet, June 2017. First published at Réflexions & échanges insoumis. Translated by David Broder. After Le Monde revealed that Emmanuel Macron’s bodyguard Alexandre Benalla had disguised himself as a riot cop in order to beat up peaceful protestors and passers-by at a demonstration — a revelation based on a video by a comrade from France Insoumise — there has been a stream of fresh news every day or even every hour. And we probably have not heard the last of these revelations. Looking at all the elements we now have available to us, regarding either this affair itself or the wider context, we should be calling the "Benalla affair" the "Macron-Collomb affair," for it has to do with both the president and the Interior Minister Gérard Collomb. And it has much to say about the overall political situation. The simple facts of the matter show that this is, indeed, a serious affair. We now know that another person attached to Macron’s staff (Vincent Crase) committed similar acts, and that his chief of staff Patrick Strzoda was aware of these abuses. He imposed a mere two-week suspension on Benalla and, most important of all, did not report what had happened to the judicial system. In this he himself committed a crime. We also know that Gérard Collomb was made aware of these violent actions immediately after they happened and did nothing about them, committing the same crime as Strzoda. Added to that, it seems that Benalla enjoyed the complicity of the Paris police prefecture, with ranking officers sending him videos from surveillance cameras. In a classic parliamentary democracy, Strzoda and Collomb would already have had to resign. Yet at the time of writing, proceedings have only set in motion against… Benalla, while the chief of staff Strzoda and the Interior Minister are still in their posts. Beyond the simple facts of the case, this affair is also telling of the contemporary double standards. France Insoumise MPs have compared Benalla’s choice treatment with the disciplinary measures taken in reaction against anodyne protests by workers on strike, or the prison terms inflicted on Air France employees just for ripping a man’s shirt [a 2015 incident in which workers tore off two managers’ shirts]. And we can look more widely to the often short-and-sharp, repressive treatment of young people in the poorer neighbourhoods. Benalla’s actions would not have been possible without the wider context of police repression in France. It was this context that gave "cover" to these actions, even before Mr. Strzoda and Mr. Collomb themselves engaged in a cover-up. Benalla passed himself off as a policeman. If an individual, protected by the political authorities, can attack other individuals even without being an agent of the state’s repressive organs, then we no longer have the rule of law. But that is not the end of the matter. We should not forget that these images of violence had been made public on 1 May itself. The revelations concern the identity of the author of this violence, not the fact that the violence took place. These images of violence did not themselves spark any inquiry. The right-wing opposition, the mainstream media and the MPs of Macron’s En Marche party want to reduce the issue to a matter of an individual usurper posing as a policeman and committing acts of violence. The Right adds in the theme of the Élysée’s [presidential palace’s] cover-up, then stops there. By this reasoning, if these actions had been perpetrated by real policemen they would have been legitimate. This poses the need for a real political fight. To say that no, this violence would not have been legitimate if it was the work of a real policeman. Yes, social mobilisations have been hit by similar violence perpetrated by state agents, in particular after François Hollande’s declaration of the state of emergency and then its constitutionalisation by Macron. Yes, the impunity of the "forces of order" emboldens racist police violence. And yes, the public security law passed by Hollande — which established a form of presumption of legitimate defence for policemen (as well as for gendarmes, the armed police) — legitimises this impunity. The march in Beaumont-sur-Oise on 21 July, marking two years since Adama Traoré died at the hands of the gendarmes, reminded us of this, as did numerous similar struggles in recent times (for example, the one concerning the murder of Amine Bentounsi, shot in the back by the policeman Damien Saboundjian, who the courts condemned to a five year… suspended sentence. It was, indeed, this context of repression and police violence that made Alexandre Benalla feel free to attack demonstrators. After all, hasn’t this police impunity become the norm? Without doubt. And this is what allowed him to feel so untroubled when his identity was revealed. Macron and Collomb’s responsibility goes beyond their direct involvement, or that of their immediate subordinates. This affair has to be seen as part of the longer-term securitarian, freedom-destroying management of social tensions, fully in keeping with the Hollande-Valls duo. This is what has made it a matter of state. If the revelations have sparked judicial proceedings, there remains the question of more strictly political initiatives. The France Insoumise MPs’ demand for a parliamentary commission of inquiry "into the conditions of the deployment and command of the forces of order during the events that took place at the margins of the Paris demonstration" is a highly appropriate one, because it allows us to look wider than the Benalla affair itself, to police violence more generally (and this violence was the cover that Benalla hid behind, before the Élysée’s cover-up). French Communist Party MPs have made a similar demand. It should come as no surprise that the Right’s call for a commission of inquiry is formulated very differently, putting the police to one side and demanding an investigation into "the conditions in which a collaborator of the office of the president of the Republic participated in a policing operation on 1 May, the acts of violence committed on this occasion and the treatment of his involvement by his superiors." After the initial attempts to thwart it, a commission of inquiry should indeed see the light of day. But it will be more with the Right’s framing, looking at the "Benalla case" in a restrictive sense, despite the fact that these actions can hardly be seen outside of the context that we have described. It is politically important to use the "lever" provided by this commission to keep up the pressure and extend its scope to this wider context. Lastly, there are still questions to be answered: what explains the weak penalty Élysée decision-makers imposed on Benalla? How could he be part of Macron’s security detail even after Arnaud Montebourg sacked him (he had been his driver) after two weeks, having seen him flee from a road accident he had caused? Had his initiatives to buy weapons and flashballs during the Macron election campaign not alarmed campaign officials? How come the Élysée was so hesitant to begin proceedings to sack him, even after the scandal had exploded? How come Macron, usually so prompt in his communications, maintained his silence? Added to these are new questions based on Jean-Luc Mélenchon and Raquel Garrido’s accounts. Mélenchon told parliament that he had "formally" identified, in a photo, standing next to Benalla, "the man who gave [Mélenchon himself] the order to withdraw" during the silent march for Mireille Knoll [a Holocaust survivor murdered earlier this year]. All this leads to a question of no little importance: is Benalla in fact just the tip of the iceberg of clandestine repressive forces directly linked to the Élysée? Macron’s "new world" is a world of regression, exploiting the cavernous holes opened up by Hollande’s term in office. 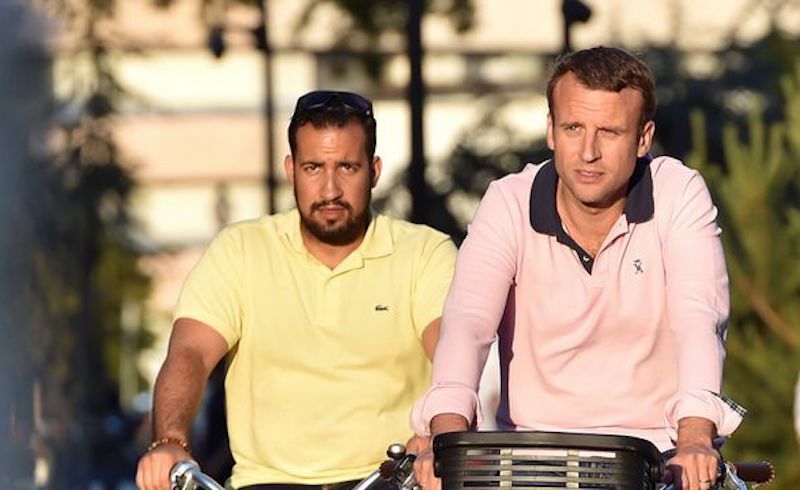 It is rather telling that Benalla came from the toxic entrails of the Socialist Party, working for Hollande before then entering Macron’s service. So, then, we have two louts both operating from the Élysée. Benalla is a sort of Macron-in-a-helmet, beating demonstrators upon the orders of Macron, who is himself a sort of Benalla wearing a banker’s suit as he bludgeons the code of workers’ rights.